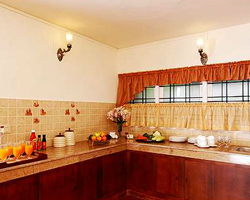 The Town House is your exclusive abode for a comfortable stay and happy moments. 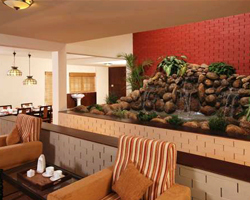 It well offers you everything to make the most of your moments precious in the heart of the city in Cochin. Here at The Town House you will feel homely, away from the hustles and bustles of busy life of the city. Get in and enjoy your home. Experience the distinctly different picnic mood. You will begin to enjoy the mix of both a town life and an exotic excursion. 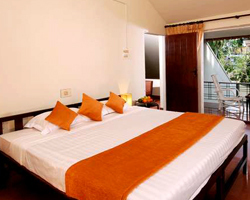 The Town House has exclusive rooms set with excellent Amenities to put you up in total comfort and pleasure. Sleep in absolute privacy accorded by the well­appointed rooms. Feel refreshed by the cool setting of the air­conditioned rooms and wake up to the all new world of fine hospitality. Have unto yourself the exclusiveness of your room privacy and give yourself a shower both in the en suite bathroom. Choose hot or cold running water as you prefer at your convenience. Cook your own food to your taste if you hire the house in full for yourself. Add a dash of family atmosphere to your vacation and revel at the togetherness. Live it up to the silence of the in­house rock garden or abandon yourself to a spell of engaging movie on the home theatre in the quiet of the visiting room. Throw yourself up completely to an absolute vacation package and idle away in your dreams. Enjoy an ordered meal from your favorite restaurants and still taste the original ethnicity at just an affordable extra service charge. Go on a shopping round with the special assistance from the guide and find the easy route to quality stuff and low price. Take advantage of the excellent laundry service for just a nominal fee. Get dressed up in immaculate style for a rest in the lush green surrounding. Park your precious vehicle quite safe in the ample parking facility built for the purpose..